Edraw Max is a quick and easy business diagram software for creating great-looking diagrams. It is easy to create SWOT diagrams, SWOT analysis diagram, Matrix, List, process and business charts with pre-drawn libraries and more than 5000 vector symbols so drawing couldn't be easier! The SWOT analysis template is normally presented by a grid, comprising four sections, one for each of the SWOT headings: Strengths, Weaknesses, Opportunities and Threats. The free SWOT template below includes sample questions whose answers are inserted into the relevant section of the SWOT grid. The questions are examples, or discussion points, and obviously can be altered depending on the subject of the SWOT analysis. Note that many of the SWOT questions are also talking points for other headings - use them as you find most helpful, and make up your own to suit the issue being analyzed. It is important to clearly identify the subject of a SWOT analysis, because a SWOT analysis is a perspective of one thing, be it a company, a product, a proposition, and idea, a method, or option, etc. The following SWOT matrix diagram is a pre-defined symbol in the Charts and Graphic library. 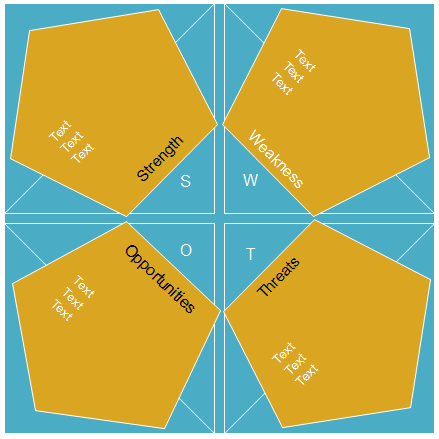 An example SWOT diagram, showing the strengths, weakness, opportunities and threats. The SWOT template illustrates how ideas for Strengths, Weaknesses, Opportunities and Threats can be captured. 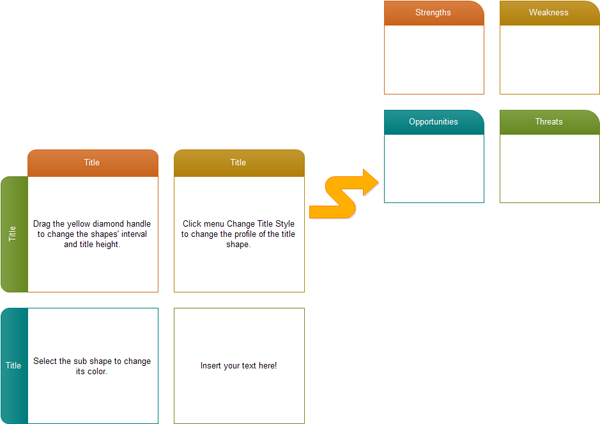 It also shows how strategies to address these ideas can be added. SWOT Analysis is a simple but powerful framework for analyzing your company's Strengths and Weaknesses, and the Opportunities and Threats you face. This helps you to focus on your strengths, minimize threats, and take the greatest possible advantage of opportunities available to you.